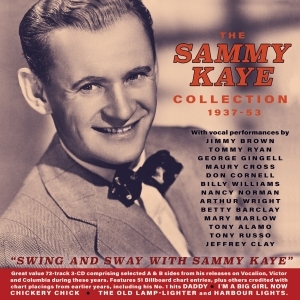 Sammy Kaye was a hugely successful and popular bandleader whose prolific hitmaking lasted from the 1930s through to the 1950s as he transcended the changing character of the popular music market with his brand of easy-on-the-ear music that blended orchestral and dance band styles with sentimental ballads, novelty songs and music from films and shows under the brand name he used both for his radio shows and on his record labels “Swing And Sway With Sammy Kaye”. He had an extraordinarily consistent record of chart success, following up several big sellers in the 1930s with well over 50 entries in the Billboard charts after the record sales charts were established in 1940. This great-value 72-track 3-CD comprises selected A & B sides from his releases on Vocalion, Victor and Columbia during these years, and features 51 Billboard chart entries, plus others credited with chart placings from earlier years, including his No. 1 hits “Daddy”, “I'm a Big Girl Now”, “Chickery Chick”, “The Old Lamp-Lighter” and “Harbour Lights”. It features around a dozen of the male and female vocalists and vocal groups who were part of his ensemble over the years, including Don Cornell prior to his successful solo career. It’s a substantial overview of the core era of his chart career and a fine showcase for his trademark brand of pop. 12 I'll Be Walkin' With My Honey (Soon, Soon, Soon) Swing & Sway With Sammy Kaye With Nancy Norman & Billy Williams.